"In Wyoming, a little girl reads people’s darkest secrets by the way they fold their arms. In New York, a man sensing patterns in the stock market racks up $300 billion. In Chicago, a woman can go invisible by being where no one is looking. They’re called "brilliants," and since 1980, one percent of people have been born this way. Nick Cooper is among them; a federal agent, Cooper has gifts rendering him exceptional at hunting terrorists. His latest target may be the most dangerous man alive, a brilliant drenched in blood and intent on provoking civil war. 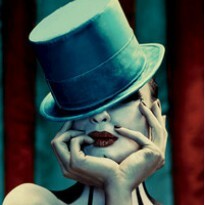 But to catch him, Cooper will have to violate everything he believes in - and betray his own kind." "I hate it, all of it. But we are vastly outnumbered. Normal people are frightened, and frightened people are dangerous. The fact is, we, abnorms, brilliants, twists, we cannot survive a war. We will lose." This was such a wild ride filled with action goodness. 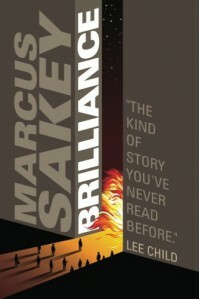 Brilliance by Marcus Sakey is a sci fi thriller that plays out like an action film. There were moments that actually made me say "holy crap! ", and heart-pounding scenes that left me a little breathless. Nick Cooper, the main character, is great. He's the perfect action hero: the guy who is not afraid to get his hands dirty and do what needs to be done, but still human and vulnerable enough that his behavior is not over the top. He's very easy to root for and to empathize with. There were only one or two testosterone filled moments where Cooper's love of fast cars caused an eye roll because it didn't feel organic. It felt more like an added element solely there to further solidify Cooper's action-dude status. Thankfully, these moments were few and far between. The story itself is very well done. Even though it's fast-paced, the author does a great job of slowing down enough to let the story unfold naturally, letting us get to know Cooper and his world. His world is essentially an alternate reality of our own, where situations like the attack on the World Trade Center never happened, and science is a bit more advanced. However, it still mirrors our reality with the age-old theme of humanity's tendency to "other" and fear what is different, as well the manifestations of that fear. Cooper is thrust into a situation where he thinks he's going to disarm 5 bombs all by himself. One bomb I can understand. But 5??? No way. Not gonna happen. Thankfully, Cooper is forced to come to his senses and the scene is saved. no, it does not end on a cliffhanger. Brilliance by Marcus Sakey definitely did not disappoint. Highly recommended for fans of sci fi thrillers and action films. Note: Brilliance is Book 1 of the Brilliance Saga trilogy. The trilogy is complete, and all three books have been released.